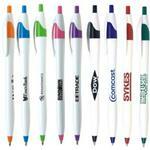 The Javalina Pen is one of our most popular pens so we are now proud to offer the same pen with a stylus tip! 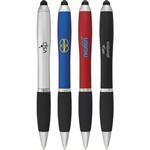 This popular and very affordable custom pen is great for trade show giveaways. Uniquely shaped body fits comfortably in your hand Great colored accents highlight your message Stylish & affordable with our guaranteed ultra- smooth writing cartridge. Black or blue ink cartridge available! FREE RUSH AVAILABLE! 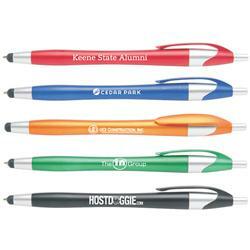 Available Colors: Assorted, Black, Blue, Green, Orange and Red with Silver Trim. Javalina Stylus Pen. 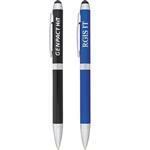 Black or Blue Ink Cartridge Available.